Following its Google I/O 2016 keynote, Google released Android N Developer Preview 3 and the first beta to Android N users. While yesterday’s update didn’t bring in any major features, there are many hidden Android N features that you can try by simply tweaking a little with the menus. 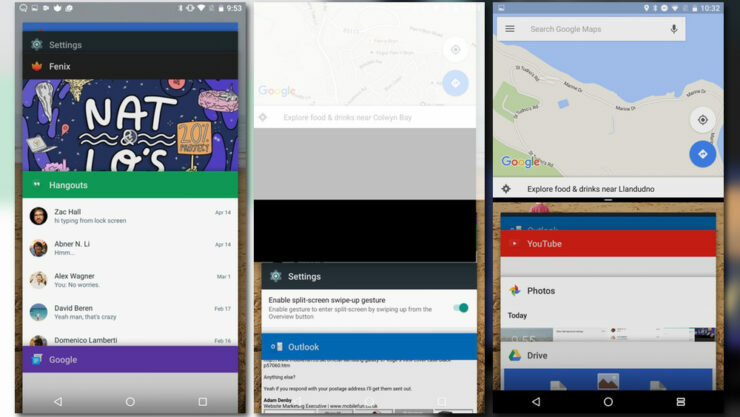 Google talked about improved multi-window multitasking modes in Android N, yesterday. While picture-in-picture is only designed for Android TV, Android phone and tablet users can experience the split-screen mulittasking feature. Can’t wait for the next developer previews or final release to bring in the feature? Well, Google has already baked it in the OS, the toggles aren’t just visible in the menus. Inside System UI Tuner menu, you can enable this secret Android N feature. Of course, you need to be on a Nexus device that’s running the latest previews of Android N.
Enable System UI tuner: press and hold the Settings cog in the Quick Toggles until your phone vibrates. You will see a pop up confirming that System UI is enabled. Go to the Settings menu and swipe to the bottom until you see System Tuner UI. Go to System Tuner UI and open the Other menu. Toggle Enable split-screen swipe-up gesture. Go back to your home screen to try it out. Simply swipe up from the Recent Apps button to enable split-screen multitasking mode. You can also hold the app switch button to activate it. Once split-screen mode is enabled, you will notice that the app switcher which usually is a single-square icon, has now turned into two parallel rectangles. All the apps in split-screen take up an equal portion of the screen by default. You can press and hold the middle split to readjust the size to whatever you want.